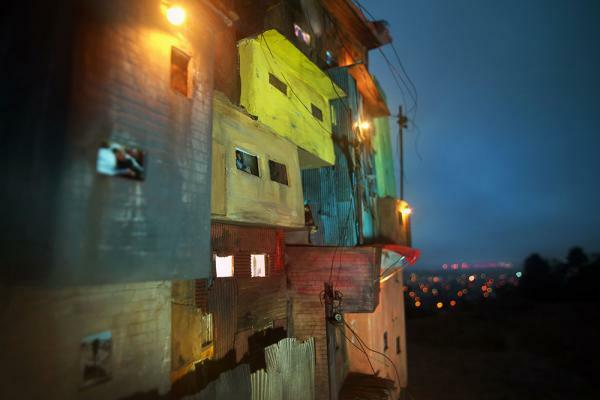 "Here and There" looks at the problems of extreme poverty, and includes artist Tracey Snelling's signature piece "One Thousand Shacks." New works--created on campus during her three-week residency--will examine these issues in the US, how they relate to location and, at times, the disenfranchisement of large groups of people for the sake of big business, political clout, and power. To meet artist Tracey Snelling evokes the sensation of a strong willed breeze determined to open a backyard door. As an artist and person, she is down to earth, direct, contemporary, and moving through it all with volition. Snelling’s artistic practice originally focused on photography as a medium, but soon evolved to include her construction of sculptures based upon cities and towns, strip malls and urban housing. She refers to her three dimensional work as sculptural rather than diorama or model making because she isn’t particularly interested in the exact rendering of location, or the contextualization of place. Instead, she taps into the energy of community and its humanness—restless, frenetic, din, a choir, extending beyond the confines of walls. Snelling’s representations are neither judgmental nor opportunistic. They unaffectedly and objectively offer a multidimensional sketch of a place in time, how we occupy space. Her signature piece "One Thousand Shacks" (included in this exhibition along with new work created during her her residency here) pushes up against the challenges of economic inequalities, racial biases, and imposed class divisions that often limit the options available to so many people. Concurrently, the installation embraces our everyday existence expressed through Snelling’s exuberant palette, bold graphics, video and neon. Conceptually, Snelling’s stacking method first creates an exalted “big picture” with a myriad of colors, image, text, sound and light. The counterpoint in scale soon immerses the viewer into each small world. With this shift, the onlooker becomes the active participant, the occupant in situ, adding the trappings of their own experiences to each tableau. It is this shift that forces the viewer into a new way of seeing from varying perspectives. On the one hand, the artist’s sculptures allude to our desire for refuge, a private domain that allows us to be ourselves. On the other, the overall composition reaffirms it is imperative that we co-exist with one another respectfully, forge relationships, understanding our marked differences. It is diversity—the unique and often disparate combination of things, the cacophony of it all, that activates communities and public space. Snelling’s constructions literally build a way out, one on top of another, charged with the undercurrent of the way we live. They emphasize our universal longing to find a place called home, and be accepted, built on the foundation of one and of many. Through the use of sculpture, photography, video, and large-scale installation, Tracey Snelling gives her impression of a place, its people and their experience. Often, the cinematic image stands in for real life as it plays out behind windows in the buildings, sometimes creating a sense of mystery, other times stressing the mundane. Snelling’s work derives from voyeurism, film noir, and geographical and architectural location. Within this idea of location, themes develop that transport observation into the realm of storytelling, with reality and sociological study being the focus. Snelling had exhibited in international galleries, museums and institutions, including the The Royal Museum of Fine Arts, Belgium; Palazzo Reale, Milan; Museum of Arts and Design, New York; Kunstmuseen Krefeld Germany; El Museo de Arte de Banco de la Republica, Bogota; the Stenersen Museet, Oslo, and the Sundance Film Festival. Her short films have screened at the San Francisco International Film Festival, the Thessaloniki International Film Festival, Circuito Off in Venice, Italy, and the Arquiteturas Film Festival Lisboa in Portugal. She also received a 2015 Joan Mitchell Painters and Sculptors Grant. Snelling lives and works in Oakland, California and Berlin, Germany.